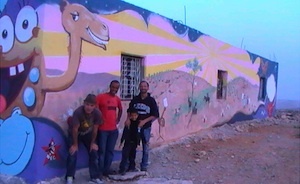 Friends of Hebron started their kindergarten initiative in the Mount South Hebron Hills, in 2009. This kindergarten has come a long way since then. This twice displaced community faces many challenges, one of which is being located in Area C in the West Bank. This means that any applications for renovations, extensions, building and expansion must be approved by the Israeli authorities. This translates into Palestinian families and villages being excluded from the master grids (both water and electricity) and rarely are permits issued for building, extensions or fixing structures that have been destroyed or damaged by the Israeli military and settlers. Whilst the Palestinians are stymied in their efforts to establish their communities, the Israeli settlements and businesses thrive and continue to expand, taking more land and resources, with their homes and businesses enjoying the luxury of electricity and water. Our partners on the ground – The Villages Group – have therefore achieved a major goal for the Um Al Khair kindergarten. As the Palestinian community remains shut out from services, new and innovative projects are being implemented to support these disadvantaged and marginalised communities. 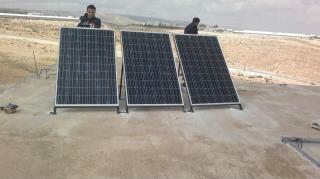 Last month the kindergarten was installed with solar panels, providing much needed electricity to this school. Congratulations need to be given to Hamed and his team who ensure that the projects we invest in are sustainable and that ongoing support is directed to these Hebron villages. The children of Umm Al Khair village, next to the illegal Karmel settlement, south of Hebron may not be allowed to permanent homes but they now have a kindergarten. The community of Umm Al Khair is located south of the Israel’s illegal settlement of Karmel in the southern part of Hebron Governorate in the West Bank. Only a barbwire separates between the settlement of Karmel (21st-century-style living) and the Palestinian community, living in rudimentary dwellings. 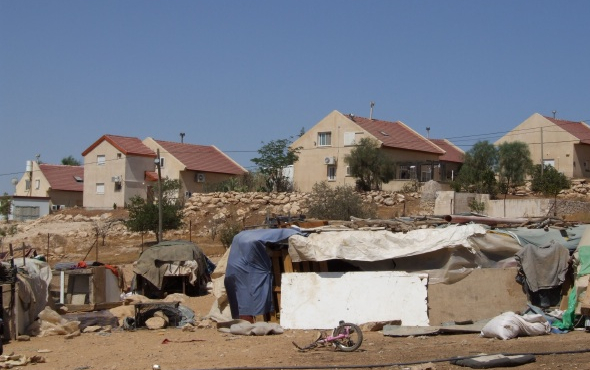 In October 31st, 2008 Israeli forces demolished a number of residential sheds in the community because they deemed it to be too close to the settlement. After the demolition, Israeli bulldozers began the expansion of the illegal settlement on the expense of the Palestinian community. been renovated with help of a donation from the Leichhardt Friends of Hebron and other organisations including the Shalom-Salaam Trust, the Hebron-Exeter Twinning Association (UK), the Villages Group and UNRWA. Today, the building has been transformed into a bright and cheerful kindergarten for the children of Umm Al Khair. The Umm Al Khair community places a high value on education but in 2009 more than 25 kindergarten-age boys and girls had no kindergarten to go to. Friends of Hebron’s 2010 Festival of Friendship raised $5,000 for the Umm Al Khair kindergarten, to put towards the rehabilitation of the building. This community is considered by the international organizations to be one of the most vulnerable in the southern West Bank. The Kindergarten had its inaugural opening in November 2010 and classes have been running since the opening. The Villages Group, a voluntary organisation of Palestinians and Israelis working together to support grassroots Palestinian communities and one of our partners on the ground, with the aid of a UK artist, has since beautified the building further by painting beautiful, colourful and inspiring murals on the walls of the kindergarten. 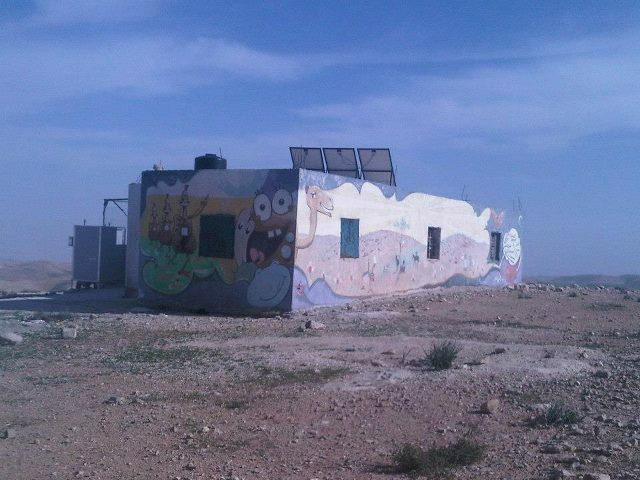 In this bleak, desert landscape in the midst of the make-shift Bedouin homes this splash of colour on the school is wonderful.